You are currently browsing the Western Custom blog archives for August, 2009. During the 1980’s, styles called for wooden patio doors with a maximized view. This was accomplished by using larger glass panels in the door; but, more glass meant reduced space in the wood frame for lock mounting. A company called Atrium came up with a solution that address that concern. 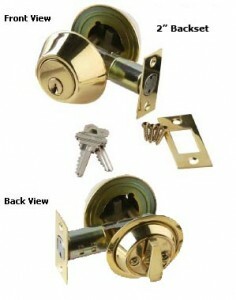 The locksets were manufactured with a 2” backset. The name Atrium Door evolved from this company, and is still used to refer to those type of doors today. Newer Atrium doors used a mortise lock with the deadbolt and lever set in one mechanism. Atrium was eventually purchased by Amerock who continued to manufacture the National type locksets with a 2” backset. A few years ago Amerock discontinued the lock portion of their business. This left the Atrium Door Hardware very hard to find. 2” Backset Door Hardware can still be found with a little diligent searching. Horseshoe-Hardware has access to this type of hardware in many finishes. Atrium style mortise sets can be located by contacting their customer service. If you are planning a new kitchen, or just planning to remodel your existing cabinetry, one thing that will set your project apart from the mundane, is the finishing touch added by incorporating Hand Carved Hardwood Corbels and other hand-carved accents within your design. With a little planning, gorgeous results can be obtained without breaking your budget. 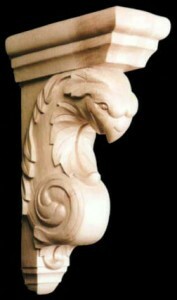 Hard carving adds character and appeal not found with machine made goods. Skilled craftsmen rely on their talents to provide works of art that will be cherished for the ages. Investigate the possibilities before deciding on less artistic solutions, and create something truly unique in the process.